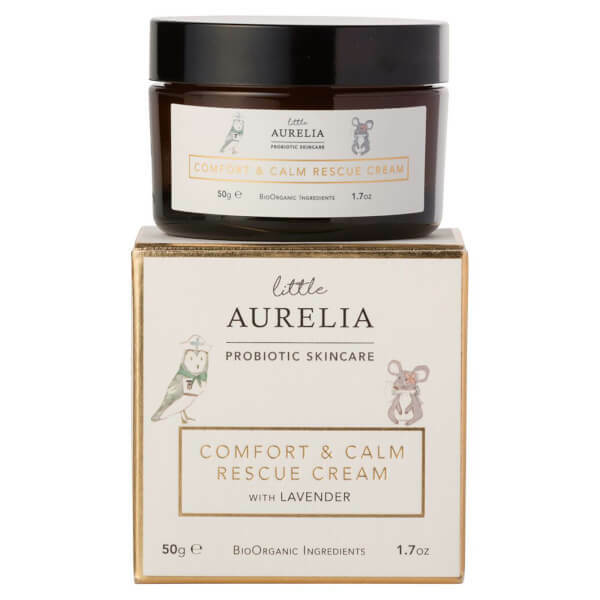 Designed for babies and young children, the Little Aurelia from Aurelia Probiotic Skincare Comfort and Calm Rescue Cream blends gentle yet effective botanical ingredients with soothing essential oils. Combining Shea and Mango Butters with comforting extracts of Calendula and Chamomile, the luxurious cream absorbs quickly into skin to replenish dry, itchy and flaky areas in need of repair. Arnica helps to relieve the effects bumps and bruises, whilst antimicrobial pure Silver and Arrowroot nourish and protect. The BioOrganic formula can be applied to dry skin, massaged onto sore bottoms as a nappy cream, or used to soothe cradle cap for long-lasting comfort. Calming Lavender Oil imparts a soft, subtle scent to calm and settle your little one at bath time or before bed. Apply the cream directly to the skin in need of rescuing with the fingertips. Not to be used on broken skin, for external use only. Aqua (Water), Theobroma Cacao (Cocoa) Seed Butter, Glycerin (vegetable glycerine), Butyrospermum Parkii (Shea) Butter, Prunus Amygdalus Dulcis (Sweet Almond) Oil, Cetearyl Alcohol (vegetable derived), Cetearyl Glucoside (derived from corn oil), Aloe Barbadensis Leaf Juice (Aloe vera), Bifida Ferment Lysate (probiotic culture), Mangifera Indica (Mango) Seed Butter, Maranta Arundinacea (Arrowroot) Extract, Rhus Verniciflua (Berry) Peel Wax, CI 77820 (Silver), Calendula Officinalis Flower Extract, Chamomilla Recutita (Matricaria) Flower Extract, Spiraea Ulmaria (Meadowsweet) Leaf Extract, Helianthus Annuus (Sunflower) Seed Oil, Avena Sativa (Oat) Kernel Extract, Arnica Montana Flower Extract, Lavandula Angustifolia (Lavender) Oil, Calendula Officinalis Flower Oil, Oenothera Biennis (Evening Primrose) Oil, Achillea Millefolium (Yarrow) Extract, Sodium Hydroxide, Aesculus Hippocastanum (Horse Chestnut) Seed Extract, Sodium Phytate (rice based), Xanthan Gum (naturally derived),Dehydroacetic Acid (natural association approved preservative), Hydroxyacetophenone (preservative booster), Tocopherol (Vitamin E), Benzyl Alcohol, Sodium Stearoyl Glutamate (naturally derived), Citric Acid (derived from lemon), Potassium Sorbate, Sodium Benzoate, Linalool*, Geraniol*, Limonene* (*naturally occurring in essential oils).